EVGANIY DRAGUNOV, the engineer of the, probably, most famous sniper rifle in the world, directed the engineering of this compact carbine in the year 1977. Its main charachteristics are: CALIBER: 5'45x39mm-Soviet CAPACITY: 30 rounds BARREL LENGHT: 212 Millimeters WEIGHT EMPTY: 2,1 Kilograms The MA carbine features an upfolding buttstock; the lower receiver and the pistol grip are all in one with the totally plastic-made frame of the weapon. The upper part of the MA carbine and its sights are made in fiberglass-reinforced polyammide. The barrel is equipped with a flash hider; the fire selector switch is little, and it is placed on the right side of the weapon. 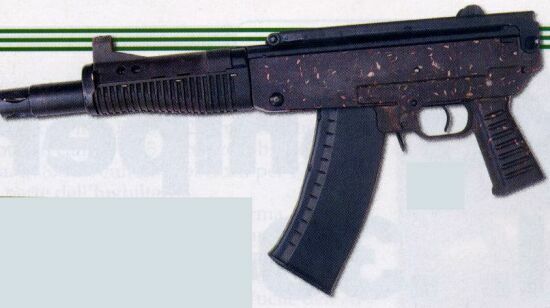 Though the MA carbine never saw mass production, it was used as a basis for the currently produced (and currently issued to Russian Special Forces) SR-1 MA "Vikhr" sub-carbine, which main difference from the DRAGUNOV "MA" carbine is that the "Vikhr" feeds from 25-rounds translucid plastic magazines and fires the 9x39mm russian ammo, which is a necked-up version of the .7'62x39mm-Soviet cartridge.